In October 2017, SMU’s Central University Libraries uploaded 311 items into CUL Digital Collections. Mineral Wells, Texas, where America drinks it’s [sic] way to health., ca. 1930, DeGolyer Library, SMU. 37 pamphlets and broadsides, ca. 1880-1930, as part of the TexTreasures FY2018 grant program, sponsored by the Texas State Library and Archives Commission and funded by the Institute of Museum and Library Services. The documents consist of printed ephemera promoting local businesses, Texas tourism, immigration to Texas, and the sale of land and real estate in Texas cities during the times of their founding and early expansion. 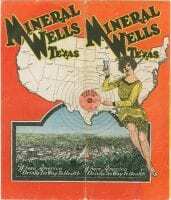 The items include pamphlets promoting travel to cities large and small, including Memphis, Fredericksburg, Brownsville, El Paso, Corpus Christi, Laredo, Tulia, Amarillo, Plainview, Dalhart, Canyon, and San Antonio. More broadsides included in this addition advertise farms, ranches, and livestock for sale in rural areas across the state. Chambers of commerce, prominent citizens, local businesses, realtors, and land agents created these promotional materials to persuade prospective residents of Texas to immigrate. A few items in this group represent specific and historically notable efforts at populating the state. One of these items is a pamphlet from the Franco-Texan Land Company, which was based in Weatherford and advertised in France. Other notable items include a pamphlet advertising home sites in Oak Cliff, which was created by the Dallas Land & Loan Company that founded the neighborhood; a broadside advertising Texas lands from the Ohio land agent, Henry H. Hannan; a promotional pamphlet for the city of Port Arthur, created by city founder, Arthur E. Stillwell, and published by his company, the Port Arthur Land Company; and a broadside promoting land in Kimble County printed on the stationery of Andrew Jackson Royal’s Texas Star Saloon in Junction City. Royal would later be elected sheriff of Fort Stockton, a career that culminated in his yet-unsolved assassination. Other notable figures include Knight Stith, a prominent citizen of Llano, and Judge Herman Henry Butz of Fort Stockton. Additional promotional materials include a pamphlet advertising the mineral-infused drinking water and health spas of Mineral Wells and broadsides featuring the prominent businesses of Del Rio and La Grange. [Construction Site, El Cuije Dam], ca. 1900s, DeGolyer Library, SMU. 17 images, ca. 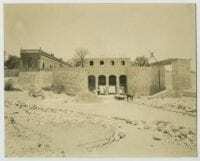 1883-1920s, from the Collection of Photographs of Mexico, primarily showing images in and around the Lequeitio estate in Coahuila de Zaragoza, Mexico. Included are the courtyard at the estate, a group portrait of estate staff, and interior views of a workshop and machinery. Also of interest are images of the construction of the dam at El Cuije and a hospital next to the Mexican Central Railway in 1883. 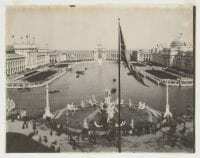 [Grand Basin, World’s Columbian Exposition], 1893, DeGolyer Library, SMU. 15 images, 1855-1909, from the Jack and Beverly Wilgus History of Photography Collection. Among these items are a number of portraits, including one of the American poet Henry Wadsworth Longfellow. Of particular note is a salted paper print taken of Lieut. Col. Shadforth and Officers of the 57th., 1856, as well as several platinum prints of images taken at the World’s Columbian Exposition in 1893. Copy of Report of Colonel Samuel Cooper…, June 14, 1851, a typescript copy of a report by Colonel Samuel Cooper, Assistant Adjutant General of the United States, of an inspection trip from Fort Graham, Texas, to the Indian villages near the Upper Fork of the Brazos River. 1 image, ca. 1880s, by Abel Briquet, from Collection of Abel Briquet Views of Mexico, of the Mexico City Metropolitan Cathedral. Puerto de Mazatlan. ”Las Olas Altas.” Cerro del Vigia, el Creston, ca. 1860s, DeGolyer Library, SMU. 40 stereographs, ca. 1860s-1870s, from the Elmer and Diane Powell Collection on Mexico and the Mexican Revolution, of many locations throughout Mexico. Of particular interest is a stereograph of Creston Hill, the highest point and southernmost hill in Mazatlan, Mexico, and an elevated view of the city of Guanajuato taken from the nearby hill of San Miguel. [Floor Display Design Sketch for Australian Fortnight], 1986, DeGolyer Library, SMU. 79 images have been added to the Alvin Colt Design Drawings, Photographs, and Other Materials for Neiman Marcus Fortnights collection. These include posters and advertising materials, photographs of floor displays from a wide range of years, and one design sketch from the 1986 Australian Fortnight. 24 documents from Sir Ellice Victor Elias Sassoon Papers and Photographs, ca. 1931-1961. Included among these are letters written by Sir Victor to his sister-in-law, Giulia Ottoboni, and other friends and family. Sir Victor writes about the construction of his home in China, parties and gatherings he attended, and of the political turmoil in India during this time period. Also of note are several speeches given by Sir Victor, the memorial address given in Bombay after his death, and letters from his sisters congratulating him upon the occasion of his engagement. 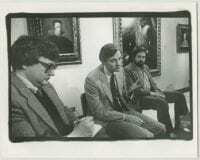 [Alan Alda and Roger Ebert, Audience Discussion, USA Film Festival, SMU], April 3, 1981, DeGolyer Library, SMU. 53 photographs from Andy Hanson Photographs, ca. 1960s-1980s. Celebrity photographs include Alan Alda, Jane Alexander, Michael Nesmith, Muhammad Ali, Marty Allen and Steve Rossi, Ed Ames, Lynn Anderson, Ann-Margret and Roger Smith, Ed Asner, Chet Atkins, Frankie Avalon, Richard Avedon, Michael and Pat York, Lauren Bacall, Paul Bartel, Mikhail Baryshnikov, Richard Benjamin, Tony Bennett, Jack Benny, and Milton Berle. Of special note is [Alan Alda and Roger Ebert, Audience Discussion, USA Film Festival, SMU], highlighting the renowned Dallas film festival that began in 1971 with the participation of SMU film professor Bill Jones. 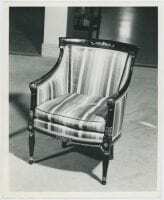 [Striped Armchair], ca. 1941, DeGolyer Library, SMU. 36 letters, photographs, design drawings, and blueprints from the Stanley Marcus Papers. These materials relate to the renovation and redesign of the second floor of the downtown flagship Neiman Marcus store, which took place in 1940-41. Of interest are photographs of chairs and a settee which were custom-designed for the store by T.H. Robsjohn-Gibbings. 7 volumes have been added to the Southern Methodist University Rotunda Yearbooks collection. These yearbooks span the years 2006 through 2012. 1 lithograph, 1912, by Thomas Moran, featuring an image of the Grand Canyon in Arizona. This entry was posted in Alvin Colt, Mexico photography, Sassoon, Stanley Marcus Papers, stereographs, TexTreasures2018, U.S. West, Wilgus Collection. Bookmark the permalink.